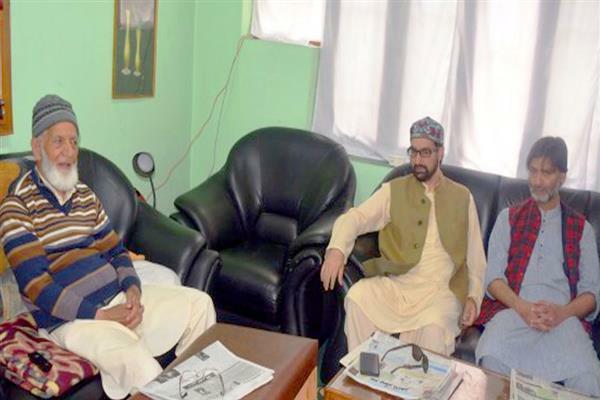 Srinagar, Feb 12 (KNS): Joint Resistance Leadership (JRL) comprising Syed Ali Geelani, Mirwaiz Umar Farooq and Muhammad Yasin Malik on Tuesday called for a complete shutdown on February 13 and 14 to protest and resist any move of tampering with Article 35 A. “It is an extremely critical issue of the our very existence as a people and of our disputed status,” they said. Leadership said people of Kashmir are facing tremendous repression tyranny and hardships by virtue of being under forcible control but it should be clear by now to those arrogant in power that they cannot break our back and make us cow down before their might. “Kashmiri’s have proved their mettle and resilience to India and the world over the last three decades by standing firm on their principled demand against a mighty military power,” JRL said.